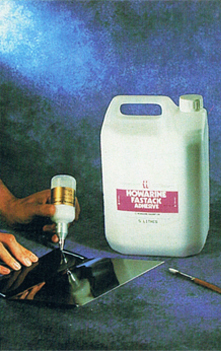 When a fast drying contact adhesive is required, there can be no better adhesive product than Fastack. The applications for Fastack are numerous, but the most common application is in gluing folders, particularly card, where one flat surface needs to be bonded to another flat surface. Fastack may be applied by brush or using the Howarine Pafra 60 Adhesive Glue Pen Dispensers. Alliteratively for longer runs, Fastack can be applied on the press or collator. When Fastack is applied to the paper, it remains fluid until is comes into contact with the paper to which it is to be adhered. The tack is very fast and complete bonding occurs with 10 minutes. Fastack is available in 15 litre, 5 litre and 3 litre containers from Howarine or through our distributor network.